This morning in Huntington at 7:30AM it’s currently 4 degrees under mostly cloudy skies. Winds are calm. Relative humidity is 84%, dewpoint 1, barometric pressure 30.12″ and falling. We have 4.5″ of crusty snow on the ground. Yesterday’s high was 34 (at 5:00AM) and the overnight low was 2. A weak area of low pressure and associated clipper systems will track east from the Great Lakes today bringing a chance of light snow to the region today and early tonight. It’ll be cloudy with a chance of snow mainly this afternoon. Highs will be around 14 with light and variable winds. Chance of snow is 40%. Tonight should be cloudy with a chance of snow until midnight. Lows will be around 2 above with west winds 10 to 15 mph, becoming northwesterly after midnight. Chance of snow is 30%. A ridge of high pressure will build in for New Years Day bringing partly sunny skies with highs 5 to 11 above and northwest winds around 10 mph in the morning, becoming light and variable. Wednesday night should be partly cloudy and colder with lows -9 below to -15 below zero and north winds around 10 mph. Wind chill values could drop as low as low as -29 below. A coastal low pressure system will effect us Thursday bringing some snow to the region with light snow accumulation possible. This system will be pretty far south, so we might get lucky and see 1-3 inches out of it. 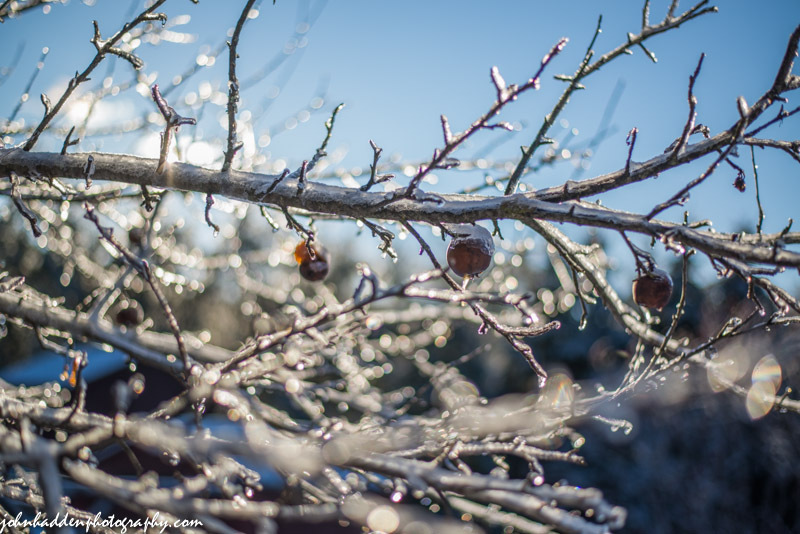 It’ll be cold with highs only -3 below to 3 above zero with north winds around 10 mph. Chance of snow is 70%. Thursday night snow is likely with little or no additional snow accumulation. It’ll be cold with lows -5 below to -10 below zero. Chance of snow is 70%. Last year on this date we had a high of 29 and a low of 11. We picked up 0.25″ of new snow and had 17.5″ on the ground. Record high was 56°F in 1965. Record low was -19°F in 1963. Tomorrow will be 0m 49s longer. The Moon is a waning crescent, 28d 12h old with 1% illumination. 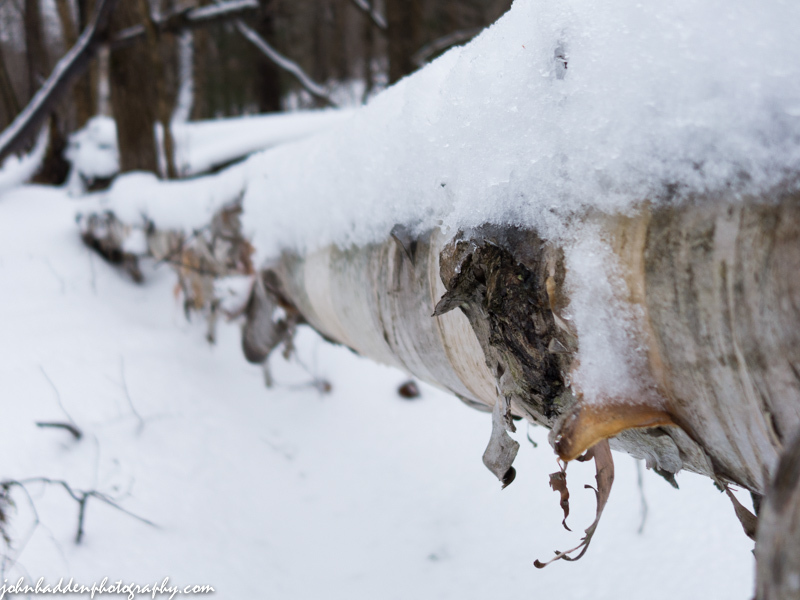 Snow and ice encrust this fallen birch down along Fargo Brook. Well that was a bust… This morning in Huntington at 6:35AM it’s currently 25 degrees under overcasts skies. There are a few snowflakes falling. Winds are out of the east at 2-5 mph. Relative humidity is 92%, dewpoint 24, barometric pressure 29.74” and rising rapidly. We picked up 0.23” of rain and no new snow (bummer…) Snowpack is now a crusty 4.5”. Yesterday’s high was 44, and the overnight low was 26. Any morning clouds and lingering snow will give way to partly sunny skies and falling temperatures during the day as a large surge of Arctic air moves into the region. Highs today will be around 14 with northwest winds 10 to 15 mph. Tonight should be mostly clear until midnight, then becoming partly cloudy. It will be much colder with lows around -9 below and north winds around 10 mph until midnight, becoming light and variable. Tuesday should be partly sunny with a slight chance of snow in the morning, then cloudy with snow likely in the afternoon as a clipper system moves on through. We may see snow accumulations a dusting to 2 inches. Highs will be around 14 with light and variable winds, becoming southerly around 10 mph and gusting up to 30 mph in the afternoon. Chance of snow is 60%. Tuesday night should be partly cloudy with a 50% chance of snow showers. It’ll be cold with lows around -2 below and west winds 10 to 15 mph gusting up to 30 mph. Wind chill values could be as low as -20 below so bundle up for any First Night travels or New Year’s Eve bonfires! New Year’s Day should be partly sunny with highs around 9 above and northwest winds around 10 mph. Wednesday night should be mostly cloudy with a 30% chance of snow. It’ll be cold with lows around -5 below. Last year on this date we had a high of 18 and a low of 5. We picked up 9″ of new snow and had 18.5″ on the ground. That was, incidentally, our deepest snowpack of the 2012-2013 season. Record high was 51°F in 1990. Tomorrow will be 0m 44s longer. The Moon is a waning crescent, 27d 11h old with 6% illumination. 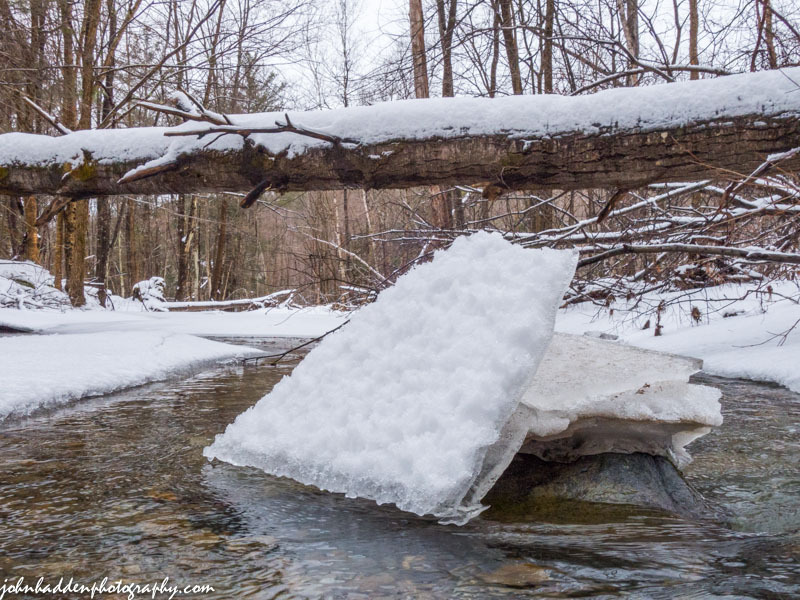 Broken ice blocks rest against rocks in the middle of Fargo Brook. Sony RX100 II, 10.4mm, ISO 800, f/11, 1/125″ exposure. This morning in Huntington at 8:20AM it’s currently 28 degrees under overcast skies. Winds are calm. Relative humidity is 98%, dewpoint 28, barometric pressure 29.91” and falling. We have 5.80” of snow on the ground. Yesterday’s high was 37, and the overnight low was 25. There is a Winter Weather Advisory in effect for our region from 3:00PM this afternoon until 7:00AM Monday. We’ve got an active 24 hours ahead of us that should deliver some much needed snow for all of you snow lovers. Low pressure lifting out of the southeast portion of the country will track up the East Coast today and move along the southern New England coast through tonight. This system will bring a mix of wintry precipitation to the area. We’ll see cloudy skies today with areas of freezing fog this morning. Snow or rain will develop this afternoon. Highs will be in the upper 30s with light and variable winds, becoming southerly around 10 mph this afternoon. Chance of precipitation is 70%. Any mixed precipitation will turn to all snow overnight and continue into morning. We can expect snow accumulations of 3 to 5 inches of fairly heavy snow here along the western slopes, with lesser amounts in the Champlain Valley and higher totals in the mountains south and east. Lows will be around 11 with light and variable winds, becoming westerly around 10 mph after midnight. Chance of snow is near 100%. Snow will continue into Monday morning, then taper off as an Arctic cold front pushes in behind the storm. We’ll see partly sunny with a slight chance of snow showers in the afternoon with additional snow accumulation a dusting to 2 inches possible. Highs will be around 16 with temperature falling to around 6 above in the afternoon on northwest winds 10 to 15 mph. Chance of snow is 60%. Monday night should be partly cloudy and much colder with lows around -10 below on north winds around 10 mph. Tuesday’s looking mostly cloudy with a 30% chance of snow showers as a weak clipper system skirts the area. Highs will be around 15 with southeast winds around 10 mph gusting up to 25 mph. Tuesday night should be partly cloudy with lows -5 below to zero. Last year on this date we had a high of 26 and a low of 18. We had 14.25″ of snow on the ground. Tomorrow will be 0m 39s longer. The Moon is a waning crescent, 26d 13h old with 12% illumination. 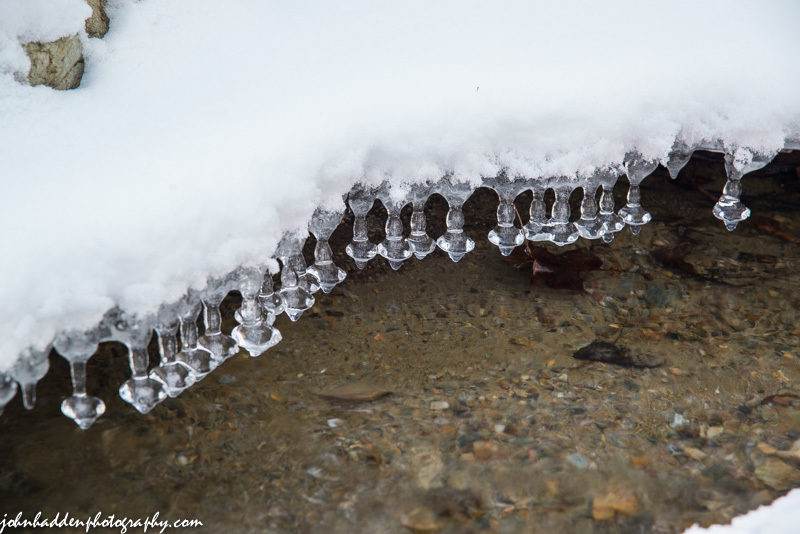 These interesting icicles formed along the bottom of the fringe ice on Fargo Brook as the water level dropped. I like there bell like structure. Nikon D600, Nikon 24-120mm lens @ 112mm, circular polarizer, ISO 320, f/7.1, 1/30″ exposure. This morning in Huntington at 7:35AM it’s currently 30 degrees under overcast skies. Winds are calm. Relative humidity is 91%, dewpoint 28, barometric pressure 30.01” and falling. We picked up 0.50” of new snow in the past 24hrs and have 6.5” on the ground. Yesterday’s high was 28, and the overnight low was 12. Low pressure moving along a frontal boundary near the Canadian border today and tonight will give way to a strong coastal low pressure system for late Sunday into Monday which will bring a round of wintry precipitation to the area. Today we’ll see cloudy skies with a chance of snow showers mainly this morning. It will be noticeably milder with highs in the mid 30s courtesy of southwest winds 15 to 20 mph and gusting up to 30 mph. Chance of snow is 50%. Tonight should be cloudy with a slight chance of snow showers after midnight. Lows will be in the mid 20s with west winds around 10 mph until midnight, becoming light and variable. Chance of snow is 20%. Arctic high pressure will begin to build in Monday. We’ll see mostly cloudy skies with a 50% chance of wraparound snow showers. Highs will be in the mid 20s with west winds 10 to 15 mph. Monday night should be partly cloudy and much colder with lows -5 below to zero. Last year on this date we had a high of 27 and a low of 20. A nor’easter was just wrapping up and we had 2.25″ of new snow and 16″ on the ground. Tomorrow will be 0m 35s longer. The Moon is a waning crescent, 25d 12h old with 21% illumination. 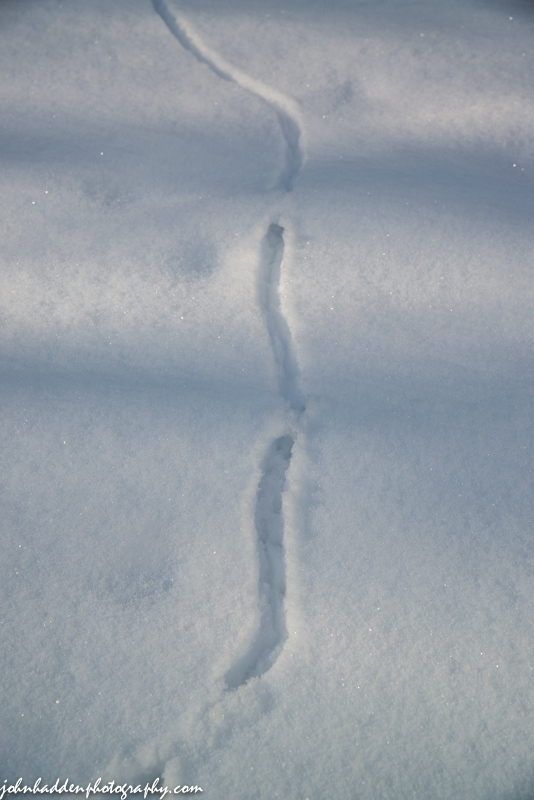 An intrepid mouse (or some other kind of rodent) made its way through the snow along Fargo Brook yesterday morning. As the photo shows, it moved along on top of the snow and would occasionally burrow down and tunnel for short distances before popping up again. Nikon D600, Nikon 24-120mm lens @ 66mm, ISO 320, f/8, 1/400″ exposure. This morning in Huntington at 6:35AM it’s currently 21 degrees and snowing lightly under overcast skies. Winds are calm. Relative humidity is 96%, dewpoint 20, barometric pressure 30.18”. We picked up 2.50” of new snow in the past 24hrs and have 6.5” on the ground. Yesterday’s high was 26, and the overnight low was 19. Quiet weather is expected across the region over the next 48 hours as a ridge of high pressure builds in. Outside of a few mainly mountain snow showers, it will be generally dry and seasonably mild temperature-wise. Today we’ll see cloudy skies with a chance of snow showers this morning. Highs will be in the mid 20s with light and variable winds, becoming westerly around 10 mph this afternoon. Chance of snow is 40%. Tonight should be partly cloudy until midnight, then become mostly cloudy. Lows will be around 19 with light and variable winds, becoming southerly around 10 mph after midnight. Saturday should be cloudy with a 20% chance of snow showers. Highs will be in the mid 30s with southwest winds around 10 mph. Saturday night should be mostly cloudy with lows in the mid 20s and light and variable winds. Sunday’s looking mostly cloudy with a 40% chance of snow as a low pressure system moves up along the eastern seaboard. Highs will be in the lower 30s with south winds around 10 mph. Sunday night snow is likely with little or no snow accumulation in our area as the storm, at least at this point in the forecast, looks to be centered fairly well offshore. Lows will be around 20. Chance of snow is 60%. Last year on this date we had a high of 26 and a low of 20. We had 8.5″ of snow on the ground in the morning and picked up 13.5″ of new snow during the day. Burlington norms for this date are highs of 30°F and lows of 14°F. Tomorrow will be 0m 31s longer. The Moon is a waning crescent, 24d 11h old with 30% illumination. Another shot from the icing event. A trio of brown apples in one of the trees in our front field. 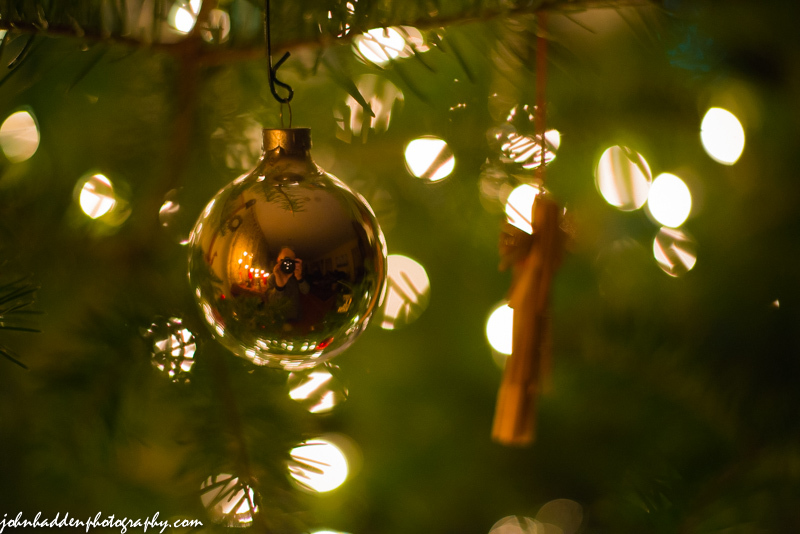 Nikon D600, Nikon 50mm lens, ISO 50, f/1.8, 1/4000″ exposure. This morning in Huntington at 7:25AM it’s currently 21 degrees and snowing lightly under overcast skies. Winds are calm. Relative humidity is 85%, dewpoint 17, barometric pressure 30.26” and falling rapidly. We picked up 0.25” of new snow overnight and have 4.25” on the ground. Yesterday’s high was 15, and the overnight low was 15. An upper level trough and associated low pressure will deliver light snow to the region though the day today. We’ll see total snow accumulations of 2 to 4 inches with higher amounts in higher elevations. Highs will be in the mid 20s with south winds around 10 mph. Chance of snow is 90%. Tonight should be cloudy with a 20% chance of snow showers. Lows will be around 19 with light and variable winds. Friday should be mostly cloudy in the morning, then become partly sunny. There’s a 20% chance of lingering snow showers. Highs will be in the mid 20s with west winds around 10 mph. Friday night should be partly cloudy with lows in the lower 20s and south winds around 10 mph. Saturday’s looking mostly cloudy and milder with highs in the mid 30s and southwest winds 10 to 15 mph gusting up to 25 mph. Saturday night should be partly cloudy with lows in the mid 20s. Last year on this date we had a high of 23 and a low of 2. We had 4.25″ of snow on the ground. Tomorrow will be 0m 26s longer. The Moon is a waning crescent, 23d 12h old with 40% illumination. 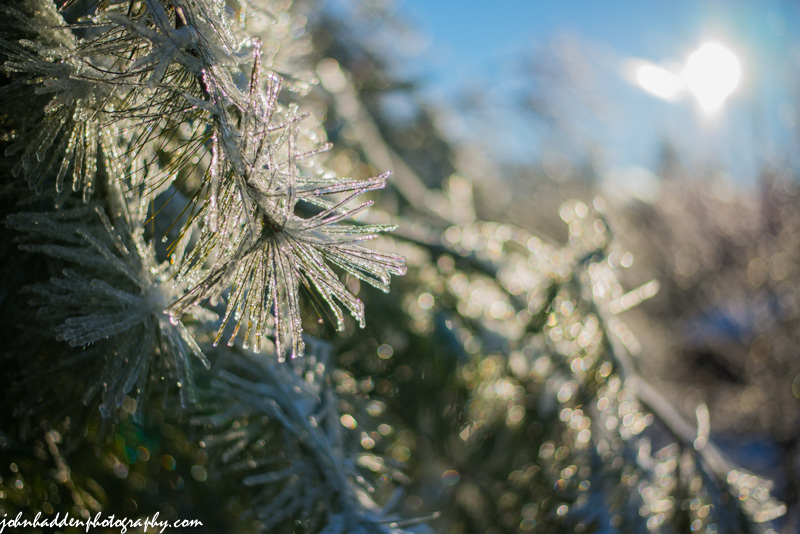 Morning sunshine makes the ice sparkle on the white pines in our front field. This morning in Huntington at 7:50AM it’s currently -2 degrees under clear skies. Winds are calm. Relative humidity is 88%, dewpoint -5, barometric pressure 30.53” and rising rapidly. We picked up 1” of light snow overnight and have 4.20” on the ground. Yesterday’s high was 25 and the overnight low was -2. Cold Arctic high pressure is currently building into the region. We’ll see sunny skies this morning, then partly sunny skies later in the day. Highs will be 8 to 14 above with north winds around 10 mph this morning, becoming light and variable. Tonight should be mostly cloudy with a slight chance of snow showers after midnight as an upper level trough approaches from the west. Lows will be around 9 above with light and variable winds, becoming southerly around 10 mph after midnight. Chance of snow is 20%. Thursday snow showers are likely as the trough moves in. Total snow accumulations of 2 to 4 inches are possible. Highs will be in the upper 20s with light and variable winds. Chance of snow is 70%. Thursday nigh should be cloudy with lows around 18 and light and variable winds. High pressure will move in Friday bringing partly sunny skies with highs in the mid 20s and west winds around 10 mph. Friday night should be partly cloudy with lows around 15. Last year on this date we had a high of 23 and a low of 5. We picked up 1.25″ of new snow and had 4.50″ on the ground. Burlington norms for this date are highs of 30°F and lows of 15°F. Record high was 62°F in 1964. Record low was -25°F in 1980. Tomorrow will be 0m 22s longer. The Moon is in its last quarter, 22d 12h old with 51% illumination. Something of a self portrait in this morning’s photo. Merry Christmas to all my friends who celebrate the holiday, and thanks to all my dedicated readers who follow my weather blog—I appreciate it!